Firenze Talis Park Homes: This spectacular showcase estate home is a sight to behold. This magnificent residence is situated on a coveted parcel in the gated Firenze neighborhood, an exclusive gated enclave in Talis Park. This estate overlooks sweeping views across the signature 18th green of Talis Park’s meticulous, Norman/Dye-designed golf course. Just moments away is the award-winning Vyne House clubhouse, where members enjoy formal and casual dining, beach access, full social calendar including concerts and events on the Great Lawn, and much more. Made for entertaining, this home presents a fabulous first impression with its grand foyer and spiral staircase leading into a spacious great room with stone fireplace, wooden beams and intricate details. Its expansive, open kitchen is highlighted by a Wolfe induction cooktop and French oven. The expansive outdoor living area features a kitchen and bar area, lighted gazebo, pergola, and numerous terraces. Syrian stone surrounds the personal resort pool, approximately 50’ long and featuring a water slide from the top of a lushly landscaped, rock waterfall. Prato Grand Estates Talis Park Homes: Located in the exclusive Prato neighborhood of Talis Park with spectacular views of 14th hole, this property epitomizes the ultimate Naples lifestyle. Every room of this home has been exquisitely crafted with both form and function in mind. First enter the grand 2 story foyer over-looking a magnificent water feature!! The Main Level is comprised of the spacious Master Retreat and three Guest Bedrooms, Wine Room, a Kitchen with wrap around French windows and a formal dining space, perfect for entertaining. The grand French doors welcome you to a private ORGANIC culinary garden consisting of fresh herbs and fruit trees just outside of the kitchen dining. Sliding Glass Doors reveal an inviting Outdoor Living area complete with Gas Fireplace, Outdoor Kitchen, Custom Pool, and surround sound. Finishes are the highest level; features include extensive Woodwork/Trim, Miele appliances, and top-of-the-line lighting and sound systems. This home is an absolute “experience”. Prato Grand Estates Talis Park Homes: SEE VIRTUAL TOUR!! EXCLUSIVE GOLF/GATED AWARD WINNING COMMUNITY OF TALIS PARK!! Encompasses over 11,000 total sq. ft with a 2017 addition bringing the home to 6 BRs, 4 KING BEDROOMS in the main house and 2ND FLOOR OFFICE/BALCONY & CASITA...private KING guest suite!! All bedrooms are ensuite & comfortably support king-sized beds, including a HUGE master suite. NEW quartzite countertops in kitchen AND sunken wet bar bar in LR, NEW painted white cabinets, DR, billiards/wine & entertainment rm, expanded lanai, OUTDOOR FIREPLACE & DR, CUSTOM Infinity Pool & Spa! 2 Tankless Heaters, Oversized Garage..NOTHING HAS BEEN SPARED! Home automation, architectural details, exterior lighting, custom ceilings, NATURAL GAS, fire bowl! This hard-to-match, COMPLETELY PRIVATE TROPICAL PARADISE await your family with arguably THE BEST VIEW IN ALL of Talis Park! The SOUTH FACING, STUNNING LAKE VIEWS overlooking the 15th green of the Greg Norman/Pete Dye designed course, rated in the Top 20 of Florida's Finest! Talis Park's Vyne & Clubhouse hosts 4 dining venues Great Hall, Grill Room, Fiona's Market, Fitness, Yoga/Pilates Studio, Tennis, Bocce, Community Pool/Spa! CALL TODAY/SEE AGENT REMARKS! Isola Bella Talis Park Homes: NEW CONSTRUCTION! $97,500 Golf Memberhip included, for a limited time! Currently under construction to be completed in early 2020, Seagate Development group is proud to present the Monterey, in Isola Bella at Talis Park. This custom home resides on an exclusive home site located within steps of Talis Park’s award-winning Vyne House clubhouse. The two-story, 4,414 sf Monterey model includes a wide foyer that leads to sitting area, wine room, powder bath, VIP guest suite, and an elevator. Beyond the sitting area, the living space features a great room, a dining area with wet bar and built-in cabinetry, and an island kitchen with a walk-in pantry. The great room and dining area open to a massive outdoor living area with a huge multi-level deck with a spill-over pool and spa. Upstairs, the master suite and spacious loft open to a party sundeck. The master suite features two large walk-in closets and a bath with separate water closets, separate vanities, a free-standing tub, and a walk-in shower. Two guest suites with private baths and a second laundry room are also included upstairs. The model will feature interiors designed by Theory Design’s award-winning designer, Ruta Menaghlazi. Isola Bella Talis Park Homes: NEW CONSTRUCTION! For limited time, the builder is offering a Golf Membership worth $97,500. Currently under construction and to be completed in early 2020, Seagate Development group is proud to present the Sonoma, in Isola Bella at Talis Park. This custom home resides on an exclusive home site located within steps of Talis Park’s award-winning Vyne House clubhouse. The two-story Sonoma model will feature a 4,012-sf living area with a luxurious outdoor space with an outdoor kitchen and a spacious deck with a custom pool and spa. The first floor of the open-concept design will include an impressive entry sequence and foyer, a great room and dining area opening to the outdoor living area, an island kitchen with walk-in pantry and a VIP guest suite. A wine room and bar will complete the space. An elevator to the second floor opens to a huge master suite with two walk-in closets, a sitting area opening to a covered deck. Two guest suites, one of which opens to the deck, a comfortable loft with a morning bar, and a private study or exercise area are also included on the second floor. The model will feature interiors designed by Theory Design’s award-winning designer, Ruta Menaghlazi. Isola Bella Talis Park Homes: NEW CONSTRUCTION! To be built by Seagate Development Group. For limited time, the builder is offering $100,000 in finish upgrades. Build your custom home in Isola Bella at Talis Park; multiple floor plans available. With only 17 beautiful home sites, the opportunity to live in Isola Bella and in the heart of Talis Park is limited. Because of its location and magnificent views, Isola Bella will be one of Talis Park’s most exclusive neighborhoods, The views from the neighborhood are truly one-of-a-kind. Residents will be within immediate proximity to the Great Lawn and to everything that the award-winning Vyne House has to offer. Seneca Talis Park Homes: This Magnificent south facing custom home offers exquisite craftsmanship and designer details throughout. Designer decorated and furnished with open floor plan that offers, foyer, living room, eat-in gourmet kitchen and dining area, separate bar, office /den, large master and 2 large guest suites. Perfect for entertaining, the outdoor living area has a pool, spa & spacious covered lanai w/ fireplace, summer kitchen & seating area w/views over lake & golf course. Lush landscaping compliments the luxurious feel of this beautiful home. Features incl Pecky Cypress ceilings, whole house generator, automatic bug & storm screens on lanai, beautiful stone & wood flooring throughout, Icynene attic insulation, security system, built in cabinetry, buzz off system on lanai, Sonos, Gas & Heat pump on pool, etc. Original owners have meticulously maintained this home in mint condition. 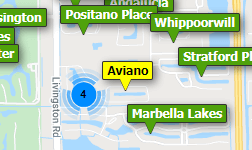 Come see this beautiful home where you will live the Naples lifestyle you seek. Talis Park's golf course was designed by Norman/ Dye, ranked one of FL's top 20 courses. Close to “Vyne House” (Clubhouse of the year 2016 by Golf Magazine!) & offers an array of amenities, incl tennis, spa, dining and fitness classes. Corsica Talis Park Homes: NEW CONSTRUCTION! JUST COMPLETED! Showcasing interiors designed by Clive Daniel Home, the stunning Marlowe I residence includes 4 bdr, 4 full baths and 2 half-baths with dining area, island kitchen and great room that opens to covered patio and Solana with outdoor kitchen and outdoor shower. Owner's suite has dual walk-in closets, a bedroom with sitting area, double doors opening to patio, bathroom with separate, dual vanities, stand-alone tub, and a large glass-enclosed shower. The plans also include portico entry, 3 car garage. This residence is designed in transitional style with color palette of white, gray, emerald green and taupe. The home’s great-room style is ideal for entertaining with second floor featuring guest living space with its own porch. The home overlooks Talis Park’s Norman/Dye-designed golf course, just moments from Talis Park’s award-winning Vyne House clubhouse. In addition to Talis Park’s 18-hole golf course, residents enjoy an array of amenities including Casa Cortese Sports Pub, Sports Complex with tennis, bocce, lap pool, and beach access via The Beach Runner, the community’s exclusive shuttle service with complimentary trips to and from Vanderbilt Beach. Corsica Talis Park Homes: Spaciously set on a 77' wide lot and built by Harbourside Custom Homes this home is now available for purchase! The architecture of the spacious 3,175-square-foot Home combines traditional with clean contemporary lines. An open great room floor plan maximizes the connection between the indoors and a spacious outdoor living area. The plan includes three bedrooms and a gourmet island kitchen fully equipped with the top of the line appliances, and flows into an open dining room space that over looks Florida's outdoor living. The great rooms 10ft sliding glass doors pocket right into the walls of the home and extends the home into a grand covered outdoor living area of over 500-square-feet. The outdoor area includes a bar, television and lounging by the fireplace in seated area, summer kitchen (with natural gas grilling), pool and spa. The look and feel of the design will present a coastal Floridian vibe that conveys a casual elegance. The color palette includes creams, beiges, whites, and grays; a vibrant coastal palette. Fairgrove Talis Park Homes: Elegantly appointed, former Harbourside Custom Homes model designed and decorated by Vogue Interiors. Excellent condition as only used 4-5 months a year. All furnishings and accessories included. Spacious 3 bedroom split plan plus study and 4 full bathrooms. Great room with built-in wall unit including a bar with wine cooler and refrigerator. Formal dining room, breakfast nook and a beautiful kitchen with granite countertops and center island, Thermador appliances, including an induction cook top. Spacious outdoor living with a seating area overlooking the soothing pool, spa and water features, fireplace, outdoor kitchen and dining area. Plenty of deck space for relaxing poolside. Spectacular & private southern exposure views of the lake and award-winning Pete Dye/Greg Norman 18-hole golf course. Many upgraded features and details. Lifestyle amenities at Talis Park include 4 dining options on site, golf course,6 har-tru tennis courts, bocce ball, cardio & weight rooms, Pilates, Yoga, Spinning & Barre studio, Esprit Spa, NEW Beach Shuttle 7 days a week and an array of activities. A MUST SEE, call for your appointment. Watercourse Talis Park Homes: Spacious outdoor entertaining lanai offers a south western sunset exposure. The upgrades in this award winning Ficarra Design include: (1) Custom Design Trim Package, (2) Deluxe Designer Furniture Package, (3) Chef Kitchen Appliances, (4) Upgraded Cabinets and Custom Additions, (5) Custom Marble Master Bath with Oversized Shower and Dual Washrooms, (6) Grand Master Closet, (7) Custom Built Quad Bunk Beds, (8) Custom Wall Unit, (9) Wood Floors Throughout, (10) Two Air-conditioning Units, (11) Automatic Blinds and Screens, (12) Zero Edge Infinity Pool, (13) Audio Sound System, (14) Marble Pool Deck, (15) Upgraded Plumbing and Electrical, and a full designer outdoor kitchen. With just a short walk away from Casa Cortese's outdoor bar and the award winning Vyne House Club this home sits in a premium location. Ready now for immediate occupancy and equipped with over $600k in custom upgrades! Brightling Talis Park Homes: From the moment you enter the grand impressive gates you will be in love! Follow the incredible brick streets through the Olive trees to the original Fox Custom model home, this is one of the few 2-story homes offering stunning golf course views down the 11th fairway & lakes at Talis Park. The foyer leads to an open great room, kitchen, and dining area continuing to a tranquil pool, spa and outdoor kitchen. The master suite is on the first floor and has a private entrance to the patio. There is a second bedroom and office on the first floor with a private second floor loft and third bedroom leading to the beautiful second floor balcony retreat, featuring a spectacular view of the greens. This home is designed to a designer's delight form this cozy home to the Vyne house featuring Fiona's Cafe and Casa Cortese Grille and sports pub, Talis Park will continue to impress. Don't miss the state of the art fitness, spa, card and board rooms, driving range, bocce, tennis and of course golf! Pistoia Casa Talis Park Homes: Exquisite Luxury Defines this Talis Park, North Naples Home Built by WCI with 3 Bedrooms +Den/Office, 2nd Story Private Balcony MBR Suite, 4 Full Bath, Great Room, Natural Gas 6 Burner, Granite Kit, 2 DW, Breakfast Room, Formal LR and DR. Outdoor Lanai with SWEEPING SUNSET/WESTERN EXPOSURE, PANORAMIC GOLF COURSE/WATER VIEWS! NAPLES BEACHES & BEAUTY Further Accentuates This Lovely Home, Viking SS Appliances, Plantation Shutters, REMOTE Electric Awning, Outdoor Kit Gas Grill Wine/Water Cooler and Pool Bath! TALIS PARK - Clubhouse of the Year 2016 by Golf Inc. Magazine AND Golf Digest Lists as 1 of FL's Top 20 - $35,000 SPORTS MEMBERSHIP INCLUDED! Greg Norman/Pete Dye Designed, Professionals Pro shop. BEACH SHUTTLE, Spa/Fitness/Yoga/Pilates/Spin and Barra Classes, 4 RESTAURANTS, Community Amenities - Vyne House and Grill Room Poolside Service, Sports Bar, 6 HAR-TRU LIGHTED Tennis Courts, Bocce! 20 mins. to RSW, Downtown Naples, Beaches, SOUTHWEST PARADISE - SEE VIRTUAL TOUR!! CALL TODAY FOR MORE INFORMATION! Pistoia Casa Talis Park Homes: INCREDIBLE VALUE at this NEW PRICE in TALIS PARK! This fabulous one story home, with a separate guest cabana, features expansive views of the Talis Park golf course and glistening lakes. The breathtaking vistas create a perfect backdrop for evening sunsets. Refreshingly transitional, this home was originally built by WCI as a professionally decorated model. Current owners have added sophisticated and recent updates so there is nothing left for the new owners to do but move in and enjoy! Upgrades include warm wood flooring in the 4th bedroom/office and the kitchen/dining area, marble flooring in main living areas, a gourmet style kitchen w/ Viking appliances & natural gas, screened outdoor area perfect for al fresco dining, an oversized pool, raised spa and pool bath, two and half car garage PLUS a separate golf cart garage and exceptionally well maintained landscaping. The Vyne House club and bar, six Har-Tru tennis courts, four bocce courts, a sports complex, full service Esprit Spa, attended fitness studio, Pilates/yoga studio, beach shuttle, two dog parks and miles of areas for walking/biking make this energetic community perfect for any level of activity one is seeking! Watercourse Talis Park Homes: NEW CONSTRUCTION! Situated in one of Talis Park’s most picturesque neighborhoods, this western exposure, waterfront home offers spectacular sunset views over Lake Il Corso. The two-story Enna residence offers the largest floor plan available in Watercourse. Available for immediate occupancy, the 3,638 square feet residence includes four bedrooms, four baths, a spacious great room, island kitchen and dining area, a large upstairs loft, and a signature Watercourse outdoor living area with a captivating water view. Custom finishes include wood floors throughout the main living area, Viking kitchen appliances, custom designed heated pool with spa, outdoor kitchen with granite countertop and stainless steel grill with decorative hood, plus additional standard features included in all residences built by Distinctive Communities. moments from Talis Park’s award-winning Vyne House clubhouse and nearby amenities, Watercourse is the lowest-priced new single-family neighborhood, with the lowest fees in Talis Park. Purchase includes a sports membership ($35,000 value). Watercourse Talis Park Homes: NEW CONSTRUCTION! The Berolina is a 2,979-square-foot three-bedroom, three-and-a-half bath residence with island kitchen, great room, and dining area. The great room and first-floor master suite open to the outdoor living area. The upstairs features a guest retreat with a large bedroom with walk-in closet, private bath and Juliette balcony. Gray-toned oak wood floors throughout the first level blend nicely with the off-white kitchen cabinets. A glass tile backsplash provides a perfect complement to the kitchen’s “leathered” calcite countertops. Outside, a natural gas outdoor kitchen with a vented hood and an electric screen provide a lanai space overlooking a spa with three water features, and separate fire pit. Finished with more than $100,000 in upgrades and including a $35,000 Talis Park Sports Membership. Watercourse Talis Park Homes: NEW CONSTRUCTION! Situated in one of Talis Park’s most picturesque neighborhoods, this western exposure, waterfront home offers spectacular sunset views over Lake Il Corso. Available for immediate occupancy, the 2,979 sq. ft. residence features an island kitchen, spacious great room, dining area, and massive first-floor master suite opening to the outdoor living area. Upstairs, the guest retreat features a large bedroom with walk-in closet, private bath and Juliette balcony. Outside, a natural gas outdoor kitchen with vented hood and an electric screen provides a comfortable, flexible lanai and outdoor living space. Custom finishes include wood floors throughout the main living area, Viking kitchen appliances, custom designed heated pool with spa, outdoor kitchen with granite countertop and stainless steel grill with decorative hood, plus additional standard features included in all residences built by Distinctive Communities. Just moments from Talis Park’s award-winning Vyne House clubhouse and nearby amenities, Watercourse is the lowest-priced new single-family neighborhood, with the lowest fees in Talis Park. Purchase includes a sports membership ($35,000 value). Watercourse Talis Park Homes: The two-story, 3,198-square-foot Catania II includes four bedrooms, four full-baths, a loft, great room, dining room and island kitchen, and an air conditioned garage with golf cart storage. The master suite includes two walk-in custom closets with locked vanity drawers. Two guest suites with private baths, dual sinks and walk-in closets are upstairs along with a loft. Extra features include hurricane shutters around the lanai, custom pantry with a built in wine refrigerator, sub zero refrigerator. The large, western exposure sites offer views of Talis Park’s Lake Il Corso and are across the water from the Toscana neighborhood, with its authentic Amalfi Coast-inspired architecture. Watercourse is an enclave of 29 Spanish Eclectic lakefront, single-family detached villas built by Artisan Associates, the exclusive builder of homes by Distinctive Communities. Watercourse Talis Park Homes: A sought after one story Azurea plan offers a southwestern exposure on the waterway of El Corso. Special features include: 1.) 22 KW Whole house, natural gas generator with an auto transfer switch and WIFI monitoring. 2.) All impact resistant windows and doors, 3.) Natural gas fireplace in living room, 4.) Volume ceilings in great room and master, 5.) 36" professional grade, stainless steel natural gas oven and cooktop with pot filler faucet, 6.) 2nd pantry refrigerator/freezer, 7.) Wine cooler, 8.) Outdoor kitchen area with natural gas grilling and side burner, 9.) 18' electric roll out awning to assist with western exposure sunset and sun lighting. This home offers the convenience of its close proximity to the Vyne House Award Winning Club and Casa Cortese's out door dining.